Don’t fall for Bibi’s bid to repackage himself as a kindly mensch. 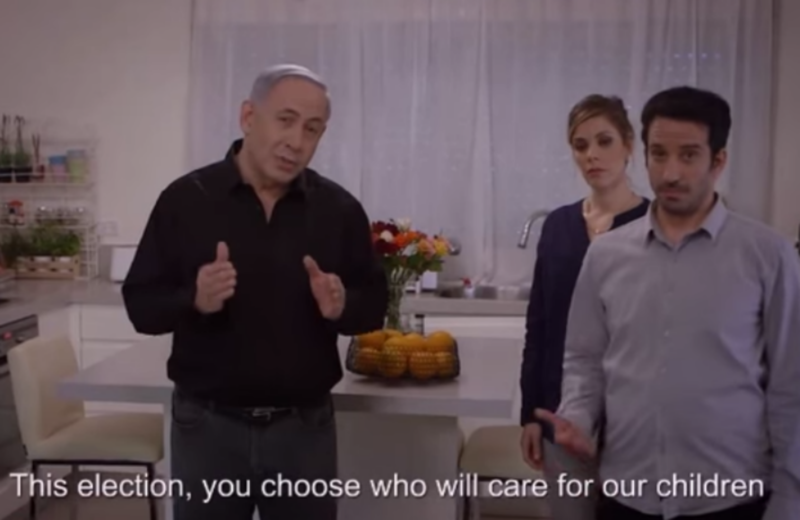 When I first saw Bibi Netanyahu’s campaign ad in which he shows up at the front door as the “Bibi-sitter” for a young couple who are getting ready to go out, I got angry. Not just because it portrays Israel as a nation of children that only he can protect, but because I liked it. It’s charming, it’s funny, and I’m afraid it will work. Like most really good political ads, “Bibi-sitter” turns the candidate’s greatest flaw into an advantage. So instead of a reckless, egoistic war hawk who’s willing to risk Israel’s special relationship with the United States in order to score partisan points in the upcoming Israeli elections, Bibi is depicted as a Jewish mensch you’d trust with your kids. In fact, the ad so softens Netanyahu’s hard edges that it ends with him all cozy under a blanket watching TV and chomping on popcorn looking like a babysitting teen. At the invitation of House Speaker John Boehner and the new congressional Republican leadership, Prime Minister Netanyahu is scheduled to address a joint session of Congress on March 3, just two weeks before the Israeli elections. In a major snub to President Obama, Bibi accepted the invitation without informing the White House, and for the first time in I don’t know how many years, support for Israel has divided along partisan lines, with some Democrats threatening to boycott Netanyahu’s speech. He’s expected to urge sanctions against Iran, and if Boehner, McCain, Graham et al. have their way, Bibi will ride in from the Middle East to help them destroy Obama’s delicate negotiations over Iran’s nuclear program, something the GOP and some Democrats haven’t yet been able to do on their own. Netanyahu had been struggling in the polls, in part because paying for “lawn mower” wars like the incursion into Gaza and ever-expanding settlements in the Palestinian territories hasn’t left much for butter after buying all the guns. The couple primping in the mirror at the beginning of the ad is a parody of the new generation of Israelis who are impatient with the austere war economy that Bibi’s Likud Party has championed. But then comes gramps, a puckish fellow, who’s going to allow them to keep their fun social lifestyle and keep them safe. Do they honestly think that his two liberal opponents, “Buji” (Isaac Herzog, head of the Labor party) and “Tzipi” (Tziporah Livni, former justice minister and a former Likud member) would be better sitters than him? “Lo, lo, lo, lo!” they cry. As is true of hard-right candidates everywhere, Netanyahu has done best when fears about his nation’s security are paramount. “With violence on the Lebanese border and worries about Iran’s nuclear program high on voters’ minds, the conservative leader’s reputation for being strong on security helped to raise his approval rating to 51 percent from 46 percent in January,” Jeffrey Heller at Reuters writes, adding, “The poll results will come as a surprise to some: Netanyahu has been fending off criticism at home and abroad over his decision to accept” Boehner’s invitation. So the ad isn’t responsible for Bibi’s revived fortunes as much as it’s his way of assuring voters that he’s tough but has a big heart. Netanyahu’s team made a harder-hitting but nearly as charming spot before “Bibi-sitter” in which he played a kindergarten teacher overseeing a bunch of unruly children, each named after one of his opponents, from both the left and the right. That ad was banned, however, because in Israel you can’t show children under 15 in a political ad. I’ve been unable so far to find out which political consultant made “Bibi-sitter,” but it has all the earmarks of an American production. It’s sitcomy, à la Seinfeld; there’s the subtle mockery of everyone in it, including Bibi. It humanizes him, and that made me a little crazy. It’s reminds me of the enduring lesson in the movie A Face in the Crowd—that a media wizard can humanize anybody, in the same way Andy Griffith’s Lonesome Rhodes lent the nickname “Curly” to the stodgy, bald Senator Worthington Fuller and transformed him into a faux folksy man of the people.